If you think of baskets as utilitarian objects, an exhibition opening on Nov. 12 at the Museum of Fine Arts in Boston will make you think again. "Fired Earth, Woven Bamboo" features modern Japanese baskets that frequently defy functionality. Instead, they look like flames, trees, birds and other unusual shapes. Traditional Japanese basketry dates back millennia, but by the early part of the 20th century, it had evolved from craft into art, as the makers—spurred on by Western modernism—increasingly stressed individuality and originality rather than a commercial purpose. By the 1950s, many works were losing all traces of their utilitarian roles. And in many of the post-2000 works in the Boston show, the artists have created even more fanciful designs. Yet these baskets have never lost their meticulous craftsmanship. This exhibition also includes contemporary Japanese ceramics, which along with the baskets were drawn from a 90-piece collection donated to the museum by Stanley and Mary Ann Snider, of Chestnut Hill, Mass. Mr. Snider is chief executive of Stanmar Inc., a developer of residences, resorts and recreational facilities. The Sniders, who began collecting Japanese ceramics in the early 1970s, added baskets a few years later when a visiting curator recognized a twisted-root-handled basket they had purchased on a lark in Kyoto as the work of renowned artist Maeda Chikubōsai (1872–1950). Soon, the Sniders realized how well bamboo art, turned into sculptural forms by inventive Japanese artists, went with their ceramics pieces. Aside from the original piece by Chikubōsai, whose works were often presented to the imperial family, the exhibition includes baskets by Tanabe Chikuunsai II (1910–2000), known for his sophisticated, finely plaited flower baskets and whose family has spawned four generations of bamboo artists; Tori Ippo (born 1930), known for his way of fashioning contrasting bands of twisting bamboo into inventive shapes; and Fujitsuka Shōsei (born 1949), whose pieces range from functional lampshades to a minimalist evocation of flames, among others. In recent years, these baskets have attracted new interest from collectors and museums in the West, even as the number of bamboo artists in Japan has shrunk. 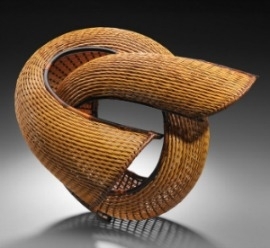 This past summer, when the Kalamazoo Institute of Arts exhibited contemporary Japanese bamboo baskets, the museum estimated that "there are now fewer than 100 working bamboo artists in Japan."